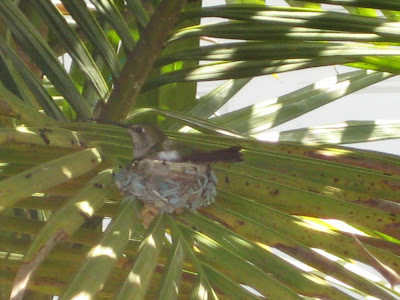 1) A hummingbird hatchling is swinging on a palm frond right this minute at Mom and Dad's house! Only a California hummer could do this, right? Momma and papa birds are sharing nest duty -- how hip of them! They're hangin' ten as the wind sways their home and their hatchling! 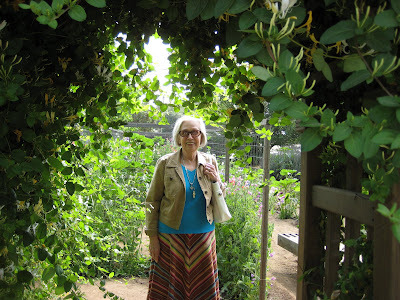 2) Mary and I made the trek to Summers Past Farms for the 3rd Annual Craft and Antique Fair. I love, love, love this event. I can barely sleep the night before. We lolly-gagged around for about two hours. 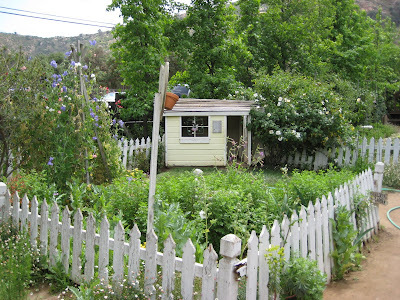 This was the entrance to the sweet pea maze. This is one of those pictures you treasure because of the memory attached to it. I love that I haven't missed the fair in three years. We both stocked up on their Herbes de Provence, and I picked up a funky orange and yellow Hawaiian house dress for $8. 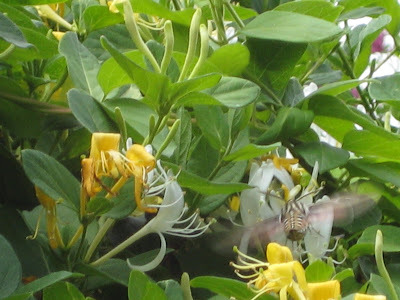 I also saw an oddity of nature -- a humming bird hawk-moth -- something I had never seen or heard of. Oh, I've lead a sheltered life. Here he is in all his mothy glory. And another of his moth-mates may be seen at Foziewisp in the Ramona post (I was there, too!). And another pic of a playhouse on the grounds at Summers Past Farms. What a great place.